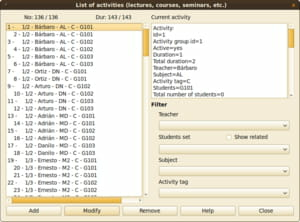 Free Timetabling Software is a program designed to generate a schedule board for students as well as for teachers. It can be used in elementary schools, high schools, and colleges. To create the schedules, the program saves in its database all of the necessary information and then displays them in its intuitive interface. It also allows you to export files to HTML, XML, and CVS formats for viewing or further editing in another software. Latest update on January 7, 2018 at 05:58 PM.